My special guest today is Loida Velasquez. She’s a very successful Real Estate Agent with over 30,000 subscribers on her YouTube channel over 7,000 Facebook followers and over 9,000 on Instagram . Listen to this interview from the standpoint of what can you learn for yourself in terms of getting active with video and other social channels. But then secondly you could share this podcast with your Agent referral partners. Why? 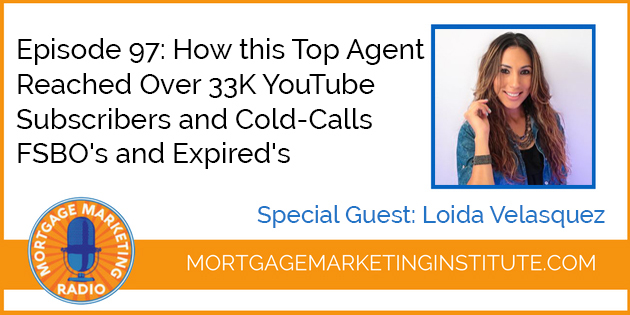 Because when you go Loida’s YouTube Channel you’ll see it is a library of awesome training and coaching on how to succeed as an Agent with Social Media. You’ll also hear how Loida is blending online with offline. Her #1 source of listings in FSBO’s and Expired’s. She cold calls and it works for her!